Remember Mr. Yuk™? Mr. Yuk™ was created by the Pittsburgh Poison Center to promote poison prevention. Parents and teachers have used the bright green and black guy to mark hazardous and poisonous items. The stickers are still available for free through the Children’s Hospital of Pittsburgh. The threat of poisoning within your home is very real. 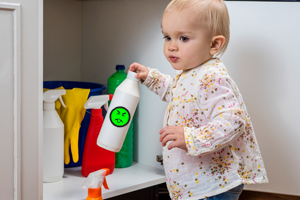 The American Association of Poison Control Centers (AAPCC) reports that centers around the country handled more than 2 million cases in which people were exposed to dangerous or potentially dangerous substances. Of those, 47 percent involved children and 93 percent occurred at home. But are you aware of all the household items that could be poisonous to you and your family? In recognition of National Poison Prevention Week, here is a list of poisonous items in your home. Be proactive about poison prevention. Grab your free Mr. Yuk™ stickers and mark those poisonous items. The AAPCC reports that 13.6 percent of cases involving child exposure in 2015 involved cosmetics and beauty products. Nail polish, shampoo, face wash and even toothpaste can be harmful if swallowed. Traditional cleaners contain lye and other harmful chemicals that can cause poisoning, either through ingestion or inhalation. In recent years, laundry detergent packets have exploded in popularity, and so too has a risk of poison to children. Just in January 2017, 769 children under the age of 5 have had exposure to these highly-concentrated detergent packets according to the AACPP, either through ingestion, inhalation or absorption through the skin or eyes. Combined, these contributed to 21.1 percent of all exposure cases involving children in 2015. While prescription bottles have childproof lids, many over-the-counter medications, vitamins and dietary supplements do not. Even those that do, are not 100 percent childproof and should be kept out of reach of children. While hand sanitizers are a must for any parent, they also come with a large risk if ingested. It might surprise you to know that since 2011, over 17,000 exposure cases involving children and hand sanitizers were reported. In an effort to encourage children to use hand sanitizers, companies have added food and candy scents to these products. To children, this makes the products appear to be edible. Because hand sanitizers contain between 40 percent to 95 percent alcohol, ingestion of the product can cause alcohol poisoning. Most pesticides are by intent poison. Even if the product boasts that it is “natural,” it does not mean that it isn’t poisonous to pets or humans. Like cleaning substances, exposure risk can include ingestion and inhalation, as well as absorption. For these reasons, always read and follow the product’s instructions carefully and keep these chemicals stored in a locked area when not in use. KBG Injury Law takes injuries as personally as you do. If you’ve been hurt due to the neglect or actions of another party, you can count on us to get you the Results You Deserve®. Contact us today.